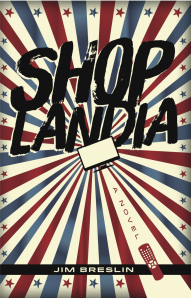 Jim Breslin’s first novel SHOPLANDIA will be launched with two events in mid-May 2014. SHOPLANDIA is a novel told through stories that follows the lives of show hosts, producers and the crew that work at the fictional shopping channel known as SHOPLANDIA. When Jake Meecham takes a production assistant job, he quickly realizes he has been dropped down a rabbit hole. Everyone visiting the live studio—reality TV stars, beloved country musicians, drunk baseball players and A-Team actors—is striving to cash in on their own version of the American dream. Meanwhile, manager Warren doubles down on his career after being inspired by a motivational guru. Fledgling show host Renee tries to determine if she has the “sales gene,” and Marketing VP Johnny Wake tracks down a troubled long lost show host. Back in the studio, producers Dottie and Dylan struggle to keep the live show running as a cascade of catastrophes unfolds on every shift. A surprising novel told through stories, Shoplandia peels back the curtain to give a humorous and tragic glimpse into the familial bonds that often form in our working lives. Thursday, May 15th, 6-8 p.m., short presentation at 7 p.m.
Sunday, May 18th 3-6 p.m.
Jim Breslin is a former TV producer who worked at QVC for seventeen years. His debut collection, Elephant: Short Stories and Flash Fiction, is available in paperback and for Kindle. Jim’s fiction has been published in Turk’s Head Review, The Molotov Cocktail, Think Journal and Metazen. Jim’s first published pieces were even shorter, his tweets were included in the book, The World According to Twitter, which was edited by NYT columnist David Pogue. Jim is the founder of the West Chester Story Slam and the Delco Story Slam.